Great collector cars are still out there--just waiting to be found! Sadly, there is very little reality in reality TV. That wouldn't be so bad except for the fact that these shows are the only TV shows for the barn-find collector car aficionado. Barn Find Road Trip is the antidote to all the manufactured collector "reality" shows. It's a real-world, barn-find banzai run in which auto archaeologist Tom Cotter, his car collector pal Brian Barr, and photographer Michael Alan Ross embarked on a 14-day collector-car-seeking adventure with no predetermined destinations. It's barn-find freestyle! Roaming the Southeast, they documented their day-to-day car search in photos and through stories and interviews. This trip is absolutely real and the same kind of junket any gearhead with the skills, knowledge, and time can undertake. Tom Cotter had long been involved in nearly every facet of the automotive and racing industries before writing his first book. From mechanic and auto salesman to heading the public relations department at Charlotte Motor Speedway, Cotter formed his own racing and automotive PR and marketing agency, Cotter Group.nThe agency represented some of the largest clients in NASCAR, IndyCar/CART, drag racing and road racing. He has written biographies of the legendary Holman-Moody race team, Tommy Ivo and Dean Jeffries, but is best known for his series of barn find books, such as Cobra in the Barn, 50 Shades of Rust and Barn Find Road Trip. Cotter appears in the Barn Find Hunter video series, which is distributed by Hagerty Insurance. He teaches public relations at Belmont Abbey College, sits on the advisory board of McPherson College’s Auto Restoration program, and is a member of the Road Racing Driver’s Club (RRDC.) He is married to Pat, has one son, Brian, and lives in Davidson, N.C.
"Three car-loving buddies took a two-week, 2,700-mile expedition to hunt down as many "lost collector cars" as they could find. By the end, they'd discovered 1,000 neglected and mostly rusted autos - Chevys, Dodges, Fords, Mercuries and even a 1932 panel delivery truck. Tom Cotter and photographer Michael Alan Ross tell their adventure in Barn Find Road Trip." "Tom's approachable writing brings the characters who've kept these cars for years, to life, and Ross did a great job capturing the rusty, crusty American and imported vehicles they encountered. Be prepared: it will inspire your own barn find dreaming." "If you want to eyeball classic rides, we'll take Jerry Seinfeld's Comedians in Cars Getting Coffee over those fake shows any day. But if you're interested in ogling real old cars lying in wait for discovery and purchase by savvy collectors, Barn Find Road Trip is a book worthy of your attention." "Hidden treasures are often found after pouring over maps, checking charts, and making repeated efforts to recover buried gold or valuable artifacts. For those addicted to searching for old cars abandoned in backyards or outbuildings, Barn Find Road Trip: 3 Guys, 14 Days, and 1,000 Lost Collector Cars Discovered by Tom Cotter and Brian Barr, with photography by Michael Alan Ross, is the perfect stocking stuffer." "Every car enthusiast dreams of unearthing a lost automotive relic tucked away in a barn somewhere. As did archaeologists Howard Carter and Lord Carnarvon in 1921 become the first souls to enter King Tutankhamen's tomb in more than 3,000 years, the gearhead automotive archaeologist enters the barn to seek rusty treasure. In barns, shops, garages, and even in large back yards, rest automotive treasures entombed for decades, waiting for an intrepid traveler to discover. Recently, a journey of automotive discovery was made by three car guys in the Southeastern part of the United States. Fortunately for all of us, they documented their trip and published a book about it." "Barn Find Road Trip is the antidote to all the manufactured collector "reality" shows. 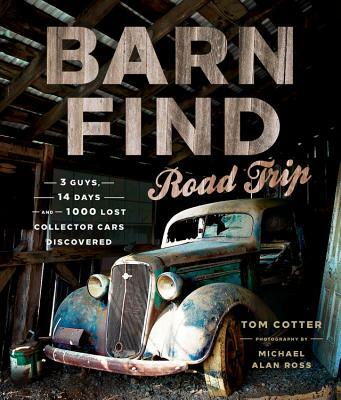 It's a real-world barn-find banzai run with archaeologist Tom Cotter, his car collector pal Brian Barr, and photographer Michael Alan Ross.If you love stories of automotive adventure, this is the book for you!" "Any old car enthusiast will love this book, and Michael Alan Ross' photographs will make you feel like you were part of the adventure." "Ace "auto archaeologist" Tom Cotter and his partner in crime collector Brian Barr may have just crowned themselves the kings of the barn find after a 14-day car-spotting road trip through the eastern United States. Armed with Cotter's customized 1939 Ford woody to break the ice, professional photographer Michael Alan Ross and no particular destination in mind, the three-man team found over 1,000 classic cars hiding in garages, barns and back lots in just two weeks."